Your first choice will be whether to go for code 80 or code 55. 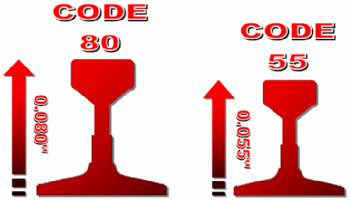 Code 80 is the standard size rail throughout the world and code 55 is a finescale version. The code 55 track and code 80 track profiles can be seen below. The 80 and the 55 stand for the height of the track, 80 being 0.080" and 55 being 0.055". Note - some older rolling stock may not run on Code 55 due to the depth of their flanges. Peco, Unitrack & Fleischmann will all connect together with no problem, they are all at slightly different heights due to the Fleischmann and Unitrack having a built in track bed. 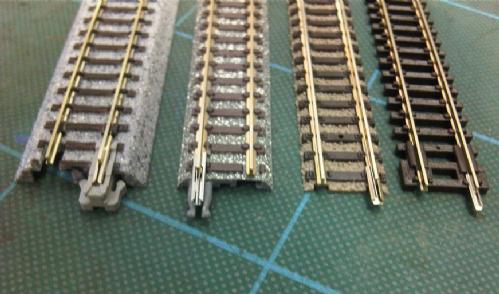 However all you need to do is to pad underneath the joining piece of track and away you go. The Tomix track is a slightly different story because it has a built in plastic joiner that is not removable (unlike the Unitrack) and is also on the opposite side to all the other tracks. However you are able to get around this problem with the Unitrack conversion track which is actually specifically designed for use with the Tomix track.